This new resource contains 200 mock test items to help nurses prepare for the Certified in Care Coordination and Transition Management (CCCTM) exam provided by the Medical-Surgical Nursing Certification Board (MSNCB) in collaboration with AAACN. 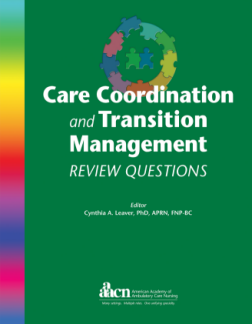 Nurses can also use the CCTM Review Questions to assess their knowledge of the practice of care coordination and transition management. The CCTM Review Questions reflects the latest test blueprint of the CCTM exam corresponding to those on the exam: Communication and transition throughout the care continuum; Education, engagement; coaching and counseling of patients, caregivers, and support network; Population health management; Patient-centered care planning and support for self-management; Teamwork and inter-professional collaboration; and Advocacy.